I recently returned from a photo shoot in Death Valley National Park, located in Eastern California, about a nine hour drive south from my home. It is the lowest, driest, and hottest area in North America. When most people think of Death Valley, they think of sand dunes and heat, but it is so much more than that, which motivated me to take the time to write about the numerous and fascinating places in the Park that I have visited and photographed since 2010, the first time I drove here as a photographer to visit the sand dunes that I had heard so much about. The valley received its English name in 1849 during the California Gold Rush. It was called Death Valley by prospectors and others who sought to cross the valley on their way to the gold fields. Even though, as far as we know, only one of the group died here, they all assumed that this valley would be their grave. They were rescued by two of their young men, William Lewis Manly and John Rogers, who had learned to be scouts. As the party climbed out of the valley over the Panamint Mountains, one of the men turned, looked back, and said "goodbye, Death Valley." During the 1850s, gold and silver were extracted in the valley. In the 1880s, borax was discovered and extracted by mule-drawn wagons. The borax mining boom had a direct influence on the future of not only Death Valley, but on the Park Service as well. After Stephen Mather, a sales manager for the Pacific Coast Borax Company, left the company he traveled the country visiting many national parks, and he met John Muir in Sequoia, and eventually went on to be appointed the first director of the National Park Service in 1916. The depth and shape of Death Valley influences its summer temperatures. The valley is a long, narrow basin 282 feet (86 m) below sea level, yet is walled by high, steep mountain ranges. The clear, dry air and sparse plant cover allow sunlight to heat the desert surface. Summer nights provide little relief as overnight lows may only dip into the 82 to 98 °F (28 to 37 °C) range. Moving masses of super-heated air blow through the valley creating extremely high temperatures. On the afternoon of July 10, 1913, the United States Weather Bureau recorded a high temperature of 134 °F (56.7 °C) at Greenland Ranch (now Furnace Creek) in Death Valley. This temperature stands as the highest ambient air temperature ever recorded at the surface of the Earth. The greatest number of consecutive days with a maximum temperature of 100° F (37 °) or above was 160 days in the summer of 2001. The summer of 1996 had 40 days over 120° F (49 °C), and 105 days over 110° F(43 °C). The summer of 1917 had 43 consecutive days with a high temperature of 120° F (49 °C) or above. The moral of this story - stay away from this area in the summer! While photographing the dunes is always very desirable, a high priority and something to look forward to, as can be seen in the image above, I planned this latest trip, together with three photographer friends of mine, based around the January full moon dates, with the specific desire to photograph the setting moon at Zabriskie Point - an iPhone panorama below gives a wide view of what one sees when you walk out to the look out point from the parking lot, shot on our scouting trip the evening before our moonset shot on the morning of January 24th, 2016. Named after Christian Brevoort Zabriskie, vice president and general manager of the Pacific Coast Borax Company in the early 20th Century, Zabriskie Point is also featured on the cover of my favorite U2 album, ‘Joshua Tree’, shown below. 'Zabriskie Point' is also the name of a 1970 movie by Italian director Michaelangelo Antonioni; its soundtrack features music by Pink Floyd and Gerry Garcia. The strategy to shoot the moon required us to find a time when the moonset would coincide with the sunrise, so that the dynamic range of available light was manageable and we could have the setting moon in a blue sky. The moon appears largest to the human eye just above the horizon, which in this location included the beautiful mountain structure of the Panamint Range, which together with the Amargosa Range forms what is generally referred to as Death Valley. In the shot below I chose to place the Manly Beacon in the foreground because it shows the textures and color contrasts of the eroded rock common in this area. Manly Beacon was named in honor of William Lewis Manly, who co-guided the ill-fated Forty-niners out of Death Valley during the gold rush of 1849. The image above was shot just after we were done capturing the setting moon. Generally referred to as the Badland Formations, this is an area of Zabriskie Point that has always caught my attention. Photographically I am drawn to the abstract nature of these formations, especially with the soft lighting present before sunrise, as was the occasion when I composed this photograph. The next area I like visiting is Badwater Basin, noted as the lowest point in North America, with an elevation of 282 ft (86 m) below sea level. Mount Whitney (with an elevation of 14,505 feet (4421.0 m)), the highest point in the contiguous 48 United States, is only 84.6 miles (136 km) to the north west. The panorama below shows the region's floor that consists of a small spring-fed pool of "bad water" next to the road in a closed drainage basin that retains water and allows no outflow to other external bodies of water, such as rivers or oceans; the accumulated salts of the surrounding basin make it undrinkable, thus giving it the name. The basin is the second lowest depression in the Western Hemisphere, eclipsed only by Laguna del Carbón in Argentina at −344 feet (−105 m). Adjacent to the pool, where water is not always present at the surface, repeated freeze–thaw and evaporation cycles gradually push the thin salt crust into hexagonal honeycomb shapes. On this particular visit, since the area had recently received an unusual amount of rain, the basin floor looked flat and soaked in moisture as seen above, but the image below from a 2011 shoot shows the salt crust pushed up into the hexagonal honeycomb shapes. A short drive north of this area is the turnoff to a loop road named Artists Drive, which rises up to the top of an alluvial fan fed by a deep canyon cut into the Black Mountains. Artist's Palette is an area on the face of the Black Mountains noted for a variety of rock colors. These colors are caused by the oxidation of different metals (iron compounds produce red, pink and yellow, decomposition of tuff-derived mica produces green, and manganese produces purple). Called the Artist Drive Formation, the rock unit provides evidence for one of the Death Valley area's most violently explosive volcanic periods. The Miocene-aged formation is made up of cemented gravel, playa deposits, and volcanic debris, perhaps 5,000 feet (1500 m) thick. Chemical weathering and hydrothermal alteration cause the oxidation and other chemical reactions that produce the variety of colors displayed in the Artist Drive Formation. We did not get an opportunity to shoot the Artist's Palette during this visit, but have chosen to include the image below from a photo shoot from a couple of years ago. The average annual precipitation in Death Valley is 2.36 inches (60 mm), while the Furnace Creek Ranch area, where we stayed, averaged 1.58 in (40 mm).The wettest month on record is January 1995 when 2.59 inches (66 mm) fell on Death Valley. The wettest period on record was mid-2004 to mid-2005, in which nearly 6 inches (150 mm) of rain fell in total, leading to ephemeral lakes in the valley and the region and tremendous wildflower blooms.Snow with accumulation has only been recorded in January 1922, while scattered flakes have been recorded on other occasions. Considering this very low annual precipitation I was pleasantly surprised a couple of years ago to discover pools of standing water in is an area named Cottonball Basin, located about 4 to 8 miles north of Furnace Creek. This is not an area easy to find as it is quite difficult to see these pools of water from the road. The water is fed from underground springs and evaporates very quickly, making it difficult at times to find, although it provides a beautiful reflective surface for any clouds in the sky at sunrise, sunset or even midday. After we checked into the hotel in Furnace Creek on our initial arrival, we drove north along Highway 190 about 45 minutes before sundown. I thought I saw water in an area about 6 miles out of Furnace Creek and took the chance that we could find it and headed out to set up and shoot the sunset, hoping to have clouds reflected in the water we may find. The image below is from that shoot looking southward into the Valley. The next day we decided to search the area with plenty of time before the sunset, and spent a great deal of time and effort looking for an ideal spot that would provide us with a larger pool of water. We walked many a mile and ended up finding another area, and again was fortunate to have clouds in the sky to create interesting and colorful reflections in an area renowned for very low rainfall and famous for its heat and sand dunes. Here is a shot of the four of us during the afternoon's search. The image above, of the sunset on our second night, is looking north with the Amargosa Range on the right hand side of the Valley, and a thunderstorm occurring to the left of the image in about the direction of the Mesquite Flat Sand Dunes area. As the sun went down the color of these clouds took on a bright yellow/orange hue but also diminished in size and volume, which made me select this shot to include in my blog. Although our recent trip did not allow us to visit this area, Rhyolite is a ghost town in Nye County, in the U.S. state of Nevada, well worth visiting, especially at sunset. It is in the Bullfrog Hills, about 120 miles (190 km) northwest of Las Vegas, near the eastern edge of Death Valley. The town began in early 1905 as one of several mining camps that sprang up after a prospecting discovery in the surrounding hills. During an ensuing gold rush, thousands of gold-seekers, developers, miners and service providers flocked to the Bullfrog Mining District. Many settled in Rhyolite, which lay in a sheltered desert basin near the region's biggest producer, the Montgomery Shoshone Mine. Industrialist Charles M. Schwab bought the Montgomery Shoshone Mine in 1906 and invested heavily in infrastructure, including piped water, electric lines and railroad transportation, that served the town as well as the mine. 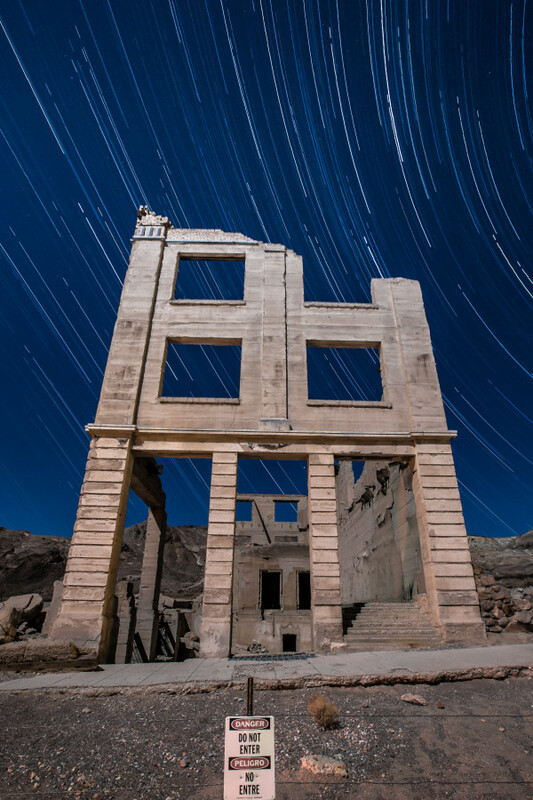 By 1907, Rhyolite had electric lights, water mains, telephones, newspapers, a hospital, a school, an opera house, and a stock exchange. Published estimates of the town's peak population vary widely, but scholarly sources generally place it in a range between 3,500 and 5,000 in 1907–08. Rhyolite declined almost as rapidly as it rose. After the richest ore was exhausted, production fell. The 1906 San Francisco earthquake and the financial panic of 1907 made it more difficult to raise development capital. In 1908, investors in the Montgomery Shoshone Mine, concerned that it was overvalued, ordered an independent study. When the study's findings proved unfavorable, the company's stock value crashed, further restricting funding. By the end of 1910, the mine was operating at a loss, and it closed in 1911. By this time, many out-of-work miners had moved elsewhere, and Rhyolite's population dropped well below 1,000. By 1920, it was close to zero. Last, but not least on my list of favorite places are the sand dunes in the Park, while famous, are not nearly as widespread as their fame or the dryness of the area may suggest. The Mesquite Flat Sand Dunes field is the most easily accessible from the paved road just east of Stovepipe Wells in the north-central part of the valley and is primarily made of quartz sand. Another dune field is just 10 miles (16 km) to the north but is instead mostly composed of travertine sand. 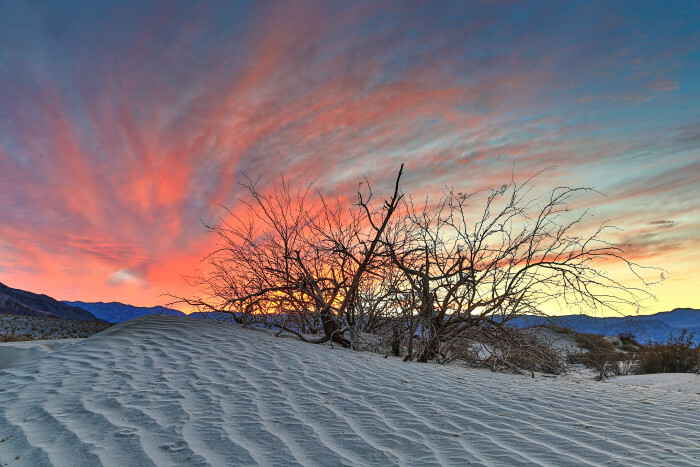 The highest dunes in the park, and some of the highest in North America, are located in the Eureka Valley about 50 miles (80 km) to the north of Stovepipe Wells, while the Panamint Valley dunes and the Saline Valley dunes are located west and northwest of the town, respectively. Prevailing winds in the winter come from the north, and prevailing winds in the summer come from the south. Thus the overall position of the dune fields remains more or less fixed. During this particular trip we visited Mesquite Flat Sand Dunes three times, albeit it the first time for a sunrise was very brief, where we encountered heavy cloud cover rendering the color on the dunes flat and monotone. Breakfast in a warm restaurant was calling and we responded instead! The second time out we visited Hell's Gate hoping to shoot a sunset, which we did not think was going to occur as we hoped, so we decided to visit the dunes area again more or less as a scouting exercise for the sunrise the next morning, our last opportunity to shoot the dunes. Truth be told, I was on the way out of the dunes area with another photographer because the light was again monotone and flat, when all of a sudden there was an opening in the sky that suddenly started to get some color on the eastern horizon. I know from experience that weather can change quickly and patience sometimes pays off. When the conditions started to change rapidly I knew we were out of position to shoot with the dunes in the foreground, so I managed to scramble around and find the composition above and catch the color, a small sand dune and desert bush. Just when the sunset towards the east began to loose its color, my attention was brought to the sky towards the west, where the sun had gone down and the sky blew up with color that I had never seen in Mesquite Flats Sand Dunes previously. Again, after a mad scramble I was able to capture the image above, which I consider a good consolation for being so far out of position! This evening's shoot gave me an idea of what to expect in this area, one I had not been to previously. The main parking lot that accommodates visitors to the dunes, while providing great access to the highest dunes in the area, omnipresent footprint unfortunately spoil most potential compositions, essentially ruining the area for photographers. It reminds me of my days as a surfer, where one was always looking to find places that weren't crowded, where surfing beautiful waves with a couple of friends was the ideal scenario. This particular spot, a good distance away from the main parking lot, provided access to medium size dunes and less footprints, albeit more than I would have liked. 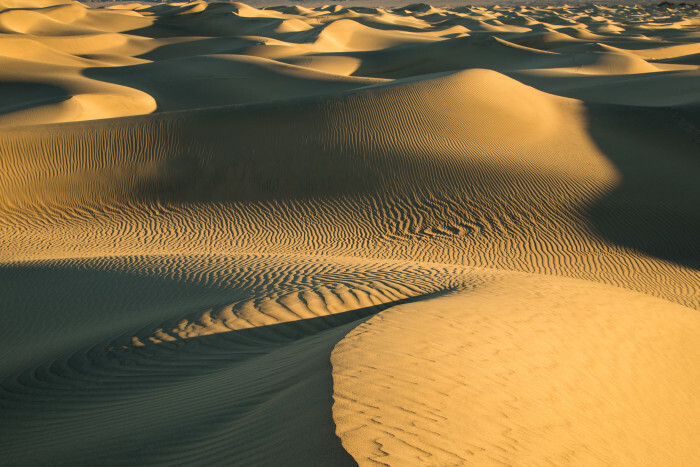 Dawn's first light is a spectacular time to be photographing on the dunes, with the amazing windswept patterns in the sand being lit up by the low light providing an overwhelming selection of compositions that are simply delightful to witness and photograph. The following images are from the next morning's shoot, where we arrived just after 6:30 am and walked out into the dunes under the bright light of a setting full moon, with the sunrise set to come over the horizon at about 7:10 am. Here are three more images, shown below, from our morning shoot on our last day in Death Valley. The sensual shapes, lines, textures, shadows and light are a photographers dream, and simply stunning to experience and witness in person. So there you have it, a summary of my favorite places to visit in the magnificent Death Valley National Park, with some history and points of interest (thanks to Wikipedia and the National Park Service), as well as images that I hope will peak your interest to visit someday. I also need to tell you that I am only scratching the surface of things to see and do here, and a great place to begin when you get to the Park is stop by the Furnace Creek Visitor Center and talk to one of the Park Rangers, who are extremely friendly and helpful to all visitors. A 20 minute park film is shown throughout the day. During the winter season, November to April, rangers present a wide variety of walks, talks, and slide presentations about Death Valley's cultural and natural history. Additional programs may be presented at other times. Inquire at the visitor center for current programs. Death Valley is truly a unique experience and the variety of places to visit could keep you engaged and busy for days.